The Bauhaus movement was a focus on radically simplified designs with an emphasis on functionality. The main idea was functionality with a de-emphasis on ornamentation, modernism, and that function should not be separate from form. Max Bill went to the Bauhaus school in Dessau, and was educated under the great minds of Kandinsky, Schlemmer, and other renown designers of the time. Bill is widely considered to be one of the most influential Swiss graphic designers of his time. His work exemplified an obsession with austere but legible and functional design. These principles were applied to the watch and clock designs of Junghans in the 1950’s. Junghans themselves is an interesting company. In the 1980’s they released the first radio-controlled table clock, and in the 90’s they did the same with a radio-controlled wrist watch. This technology opened the door for a partnership with Seiko to develop a wrist watch that automatically set the time respective to the time zone it was located it. This technology is now widely applied to watches from Seiko to Casio and beyond. The Max Bill Chronoscope fits the way you’d imagine a large vintage watch would. The rounded caseback kinda sets the watch up off your wrist, and the rounded edges of the case make it stand off your wrist as opposed to laying flat. Normally I’d be crying about how tall of a case this is (at almost 14.5mm tall), but I think the lightweight case keeps it from moving around on your wrist. Weight can go a long ways in this regard. Junghans uses their own version of the Valjoux 7750 called the Junghans J880.2. It’s a 25 jewel, 28800 BPH movement that is modeled after one of the most reliable chronograph movements used. The example I have is keeping about +6s/day, just slightly outside of COSC parameters. One strange thing to point about this watch is that the movement is noisy, very noisy, you can hear the rotor spinning when you move your arm, and the winding action is pretty tight and also very loud. Nothing leads me to believe that something is wrong, just a quirk of the movement I suppose. The case is a simple polished steel case with rounded edges that come up to meet the ample crystal. Lugs are short and very vintage-y inspired. The case is very understated, I believe in order to highlight the massively domed crystal that we’ll talk about in a second. The crown sits between two polished pushers for the chronograph. The crown is unsigned but has a decent grip to it. Like I said earlier, there is some resistance when winding the crown, but it’s size and grip works pretty well for this application. Okay, I’m going to skip straight to the crystal. It’s enormous… like, ENORMOUS. When viewed in profile it almost seems like the crystal makes up half the watch. The crystal is plexiglass, but coated with a substance called “SICRALAN,” which was developed by the automotive industry to provide a greater scratch resistance and anti-reflection properties. This crystal makes the watch, in my opinion, it just screams vintage appeal. The dial is really where you can see the influence of Max Bill on this piece. It’s simple and highly legible, definitely speaking to the function allowing for form mentality of the Bauhaus. The dial is printed, with small lumed dots at 12, 3, 6, and 9. On this particular Chronoscope there are Arabic numerals at each of the hours as well as on the minute and hour recording sub dials. Their font is simple and easily read (you’ll notice a theme with this watch). Past the hour indicators are minute counters for the chronograph. The hands are thin polished steel with lume running down the center. The sub dials sit at noon and 6, so when the chrono is reset there is a pleasing symmetry running down the middle of the watch from all the nice thin silver hands lined up. One last simple detail to go over is the date window sitting at 3 o’clock. It’s nice and small, and easily read. The Max Bill watches are available on a variety of leather straps, as well as a milanese steel strap. The particular strap I have on this Chronoscope is a ‘High Craft’ strap from Worn&Wound. Ultimately I think this watch is versatile enough to work on a variety of strap choices. When I first received the Max Bill Chronoscope in for testing, I commented that there was something weird about it. I think that I was primarily distracted by the noisy rotor in the movement and the peculiar feeling when winding the watch. Once I got past that, I quickly became fan of the piece. 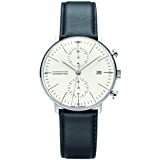 Junghans is a very unique German brand that is sticking close to it’s roots in the Bauhaus movement. There are other options out there that you could look at for something similar. Nomos would be an example at a higher price point, or Junkers at a lower, but ultimately Junghans is one of the defining brands to embrace the Bauhaus. I love that it’s a chronograph, I love the crystal (a lot), and I love the heritage behind this piece. I don’t think you could go wrong with the Max Bill Chronoscope if you’re looking for a different and functional dress piece. I recommend purchasing the Max Bill Chronoscope at Amazon. Please consider that purchasing anything through any of the links on this website helps support BladeReviews.com, and keeps the site running largely free of banner advertisements. Any and all support is greatly appreciated. Thank you very much.